Social networking has exploded in popularity over the last eight years, thanks to major platforms like Facebook Inc (NASDAQ: FB) and Twitter Inc (NYSE: TWTR). According to Statistica.com, only 24% of the U.S. population had a social networking profile in 2008. Since the recession, social networking platforms have seen extensive growth year after year of new social networkers. 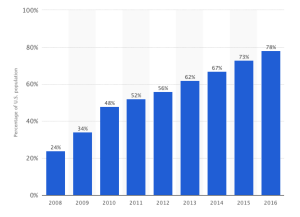 In 2016, Statistica found that the percentage of the American population with a social networking profile grew 5% from 2015 to 78%. Facebook, Inc (NASDAQ: FB) has been the overwhelming leader of the U.S. social media. As of 2016, Facebook, Inc (NASDAQ: FB) holds the largest portion of U.S. social media market with 43.9% market share. However, Facebook, Inc (NASDAQ: FB) is more of a digital sharing platform. What if someone is interested in actually being social and wanted to get out to meet new people with similar interests? The “social greeting” app is available on the Android and Apple Inc. (NASDAQ: AAPL) App Store. While the Friendable, Inc. (OTC Pink: FDBL) app has only been available on the major app store platforms since the first quarter of 2016, the app has seen success early on. As of April 2016, Friendable, Inc. (OTC Pink: FDBL) has had its app downloaded over a million times. Furthermore, the app was able to add an additional 37,470 combined-platform downloads and became the 26th most downloaded app on the Apple Inc (NASDAQ: AAPL) App Store during May 2016. Celebrities have provided a major boost to Friendable, Inc. (OTC Pink: FDBL) and its user base. The Friendable, Inc. (OTC Pink: FDBL) app was featured in Jennifer Lopez’s “Ain’t Your Mama” music video, which was released in May 2016. Within a week of the music video’s launch, it had over 30 million views on YouTube and brought Friendable, Inc. (OTC Pink: FDBL) a hefty jump in downloads, along with an increase in user time on the app. The celebrity influence continues to be a major key for Friendable, Inc. (OTC Pink: FDBL) to increase its brand awareness, access to celebrity promotion of app to their tens of millions of social media followers, etc. While JLo remains the only celebrity attached to Friendable, Inc. (OTC Pink: FDBL) at the moment, rumors suggest that there may be more celebrities on the way. 8/8/16: Friendable, Inc. (OTC Pink: FDBL) released download numbers from July 2016. For the month of July, the Company posted total downloads of 31,520, with 15,035 originating from Apple’s iOS devices or the App Store, and 16,485 originating from Android or the Google Play Store. 8/17/16: Friendable, Inc. (OTC Pink: FDBL) announced the Company’s paid version of its iOS app continues to gain advances in ranking, achieving the Number 1 position for all Social Networking Apps in Australia on Thursday, August 11th, 2016. 8/23/16: The company announced significant app and app store updates to usher in a new phase of monetization testing and revenue. Improved App Store Optimization (ASO) to boost organic downloads and users. App stability and performance improvements including optimized APIs for speed and support for a high volume of transactions. Source code obfuscation for better security and protection of the source code. Remediation of image upload and messages glitches. Paging support to event comments, active chats, and notifications. Monetization features to event listings including sponsored pop-ups and highlighted events/locations. 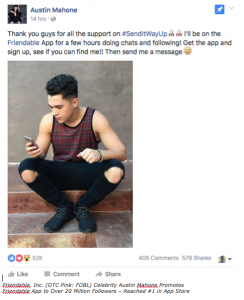 8/26/16: The company announced that music celebrity music artist Austin Mahone has been actively connecting with fans on Friendable as well as promoting the Friendable app across his social media channels. Winners of the promotion will begin to see Epic Records artists on tour starting in September in New York City, Miami, and Orlando. 9/9/16: Friendable (OTC Pink: FDBL) Announces 24% Increase in Downloads for August Over July 2016. The August 2016 download numbers for its Friendable app. For the month of August, the Company posted total downloads of 39,179 with 9,284 originating from Apple’s iOS devices or the iTunes App Store, and 29,895 originating from Android or the Google Play Store. 9/12/16: The company announced the “Movie Night with Austin,” a Meet-and-Greet for Austin Mahone’s fans, held Sunday, was a great success. 9/14/16: Friendable, Inc. announced that the Friendable app was featured in celebrity pop star Daya’s music video “Sit Still, Look Pretty,” released Friday, September 9th, 2016. What’s more, Spotify recently named Daya the winner of the latest cycle of their “Emerge” program. This honor came as Daya’s single rose to #19 on Spotify’s US Top 50 chart, the highest position for any independent artist on the chart. “Sit Still, Look Pretty” premiered on MTV as a Broadcast Prime Time premiere, and then received broad distribution on VEVO shortly thereafter. 9/20/16: The company announced the completion of the concert ticket giveaway contest which was hosted exclusively on the Friendable app. Friendable named the last three lucky winners on Saturday September 17, 2016. 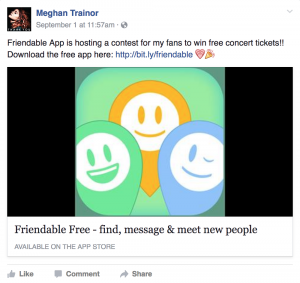 The Meghan Trainor concert give away promotion, sponsored by Friendable and available exclusively on the Friendable app was originally announced on August 31, 2016. The giveaway included two tickets for each one of three shows. All winners were provided with free tickets to see the 2016 Grammy award winner for “Best New Artist”, Meghan Trainor in concert. New winners were selected for each of Meghan Trainor’s Miami, Orlando, and New York shows in the month of September. 9/22/16: Friendable released a new app update on the Apple App Store. In addition to completing the necessary updates required to accommodate Apple’s new iOS 10, Friendable, Inc. has also made improvements in speed and overall performance of its app as well. 10/6/16: Friendable, Inc. (the “Company”) (OTC PINK: FDBL), announced it has been negotiating with the holder of specific technology that it believes will allow the Company to extend its brand and begin to uniquely monetize the Friendable app. 10/13/16: Friendable, Inc. (the “Company”) (OTC PINK: FDBL), today announced that it has received an investment commitment in the amount of $1.615 million and in connection with this commitment, the Company has completed the acquisition of live streaming video technology from Hang With, Inc.
10/20/16: Friendable, Inc. announced additional details related to its investment in Hang W/, Inc. and the acquisition of a royalty free technology license by the company. Friendable’s strategic investment in Hang W/, Inc. has not only resulted in its equity ownership, but a significant advancement in technology that will further diversify its product offering and revenue opportunities. The strategy is twofold, whereby Friendable will integrate their new live streaming video technology into its existing app as well as extending the technology into an entirely new product offering. “We are now more excited than ever for the future of Friendable, Inc. as our continued efforts to acquire users through various marketing methods are paying off on several fronts. Sometimes understanding that everything is a test is often one of the toughest things to contend with when building a business in this fast paced mobile app marketplace. Fortunately, we have captured what we believe to be the necessary data, user feedback and promotional metrics that will drive our success as we enter this next phase of our growth,” stated Friendable, Inc. CEO Robert A. Rositano Jr.
“Our strategy is one of diversification as we look ahead to 2017 and with the addition of live streaming video we are now able to leverage our existing relationships with major A-list celebrities, which have been cultivated over the past six months for an entirely new app that will focus on an artist’s fan base to provide a new and unique experience to their global audience, because most fans can’t always be there in person. Additionally, our phase two integration of live video to our existing user base of Friendable app users will provide a feature upgrade that brings the level of social interaction to a whole new level. Stay tuned for additional details in the weeks to come,” concluded Robert A. Rositano Jr., CEO Friendable, Inc.
11/7/16: The company announced that it has engaged Hayden IR, a highly-recognized national investor relations consulting firm. 11/10/16: Friendable, Inc. announced that it will be offering live, uncut, uncensored, celebrity content through a new application which has been code-named “Broadcaster”. Broadcaster is an effort to leverage the live streaming video technology that it recently acquired from Hang With, Inc. to create value for its shareholders. 12/13/16: Friendable, Inc. (OTC Pink: FDBL), has invested heavily over the last several months to ensure Fan Pass (http://www.fanpasslive.com and http://www.fanpass.live) is Robust, user-friendly and appealing to their target audience. 12/19/16: Friendable, Inc. announced that downloads of its “paid” app in France reached No. 4 overall this past weekend. As the Company prepares to roll out its live video streaming app, “Fan Pass” Live, having the Friendable app continue to demonstrate organic growth reinforces management’s confidence that 2017 will be a year of growth with two popular platforms. Management has evolved the company’s core assets through its new technology and diversification efforts, resulting in the new Friendable, Inc. Heading into 2017, the company is strategically positioned at the intersection of two rapidly growing sectors, social media and live video steaming with two unique business models with parallel paths to ROI. 1/4/17: The company is currently looking for beta testers for the Company’s new mobile application Fan Pass “Live” http://www.fanpasslive.com/beta. 1/18/17: Friendable, Inc. (the “Company”) (OTC PINK: FDBL), a mobile & social focused technology company, focused on connecting users with location-specific, interactive and live content, today announced the launch of its new website at www.Friendable.com. The refreshed look and new design match Friendable’s growing excitement for the future of what it believes is its game-changing mobile applications. Overall, Friendable, Inc. (OTC Pink: FDBL) believes “everything starts with friendship.” The company’s app helps users connect to other Friendable, Inc. (OTC Pink: FDBL) users that are living local to each other and have the same interests. People live busy lives and it can be difficult to find other people that have common interests that are living around you. Friendable, Inc. (OTC Pink: FDBL) breaks down the barriers and seeks to connect the two like-minded users without the hassle of awkward introductions or discomfort. In addition, celebrity endorsements of the Friendable, Inc. (OTC Pink: FDBL) app, allows the company to gain exposure to all of the celebrity’s social media followers. Combine with the new Fan Pass, updated application, and website, Friendable, Inc. is poised for a very strong 2017.